If you live in Liberty, MO are in need of home remodeling, tile installation, granite countertop installation, carpet install or hardwood flooring, then you need Kenny’s Tile And Flooring. Our company was first established in 1954. Ever since then, we have been committed to giving our customers the best service. We take a lot of pride in refinishing hardwood floor and tile installation. We are a family business and we’ve been around for over half a century. 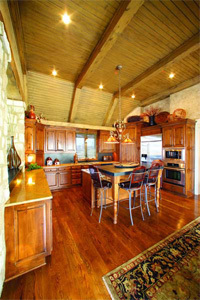 In order for any business to last for six decades, it must offer great service for any Liberty home remodeling project. Many people in Liberty are repeat customers. They come to us for hardwood flooring, or a granite countertop installation and come back for a carpet install or hardwood floor refinishing. One of the reasons that we are able to deliver such excellent service is because all of our installation and design experts are employed by Kenny’s Tile and Flooring. We never hire subcontractors. Because we employ our own fabrication and installation teams, we know how every home remodeling project will end up before it even begins. If you choose our company, then you will get the peace of mind of knowing that you are choosing professionals for your Liberty home who are very experienced. We have also built a reputation for providing great service. All of the materials are purchased directly from our vendors. Because we cut out the middlemen, we are able to provide you with exclusive products for less money. We also offer hardwood flooring and other services for a great price. Our company firmly believes that people in Liberty deserve to get excellent service, but they should also get it for a reasonable price. We also offer free estimates. We want you to have an idea of how much money you will need to spend on installing new carpet, refinishing a hardwood floor or installing new countertops. It is very easy for you to request an estimate. You can fill out a form on our website. We will get back to you as quickly as we can.